SQL Select Statement Allows you to define the main SQL of the application. You can edit this SQL to add or delete fields. Limit Lets you limit the amount of records that will be retrieved by SQL for the view in the query. SQL Preparation You can enter SQL commands or procedure names that should be executed before the main select of the application. Connection Displays the name of the connection used. This connection can be changed to another connection that has the same table. Use Customized Message Lets you define whether the “no records” message is displayed. 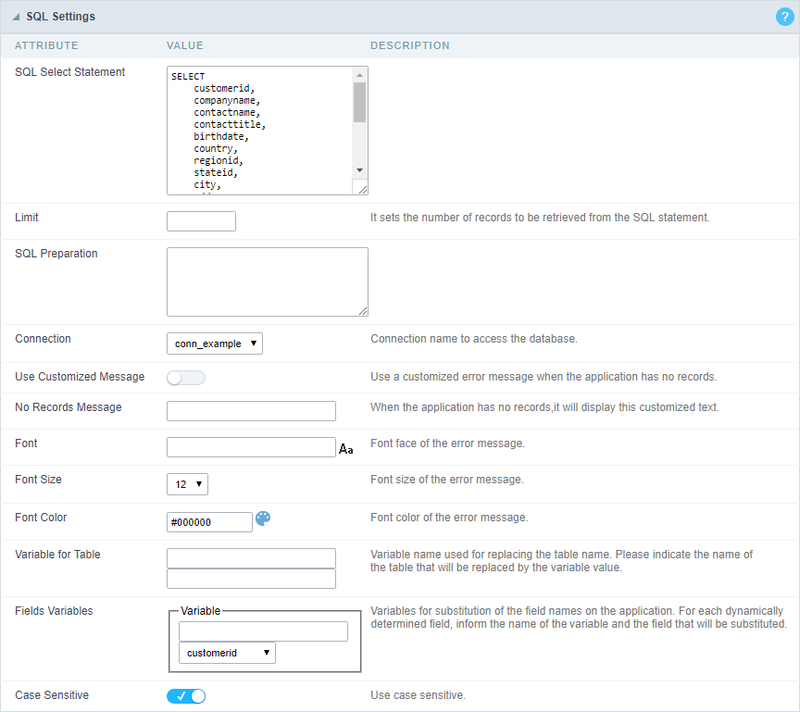 No Records Message Allows you to set the message to be displayed if the query does not return any records. Font Lets you set the font for the message, click the icon next to it field and choose the font. Available when “Use Customized Message” is enabled. Font Size Allows you to set the font size. Available when “Use Customized Message” is enabled. Font Color Allows you to set the font color. Available when “Use Customized Message” is enabled. Variable for Table These fields informed with value, allows part of the table name defined in the select to be changed before the execution of the command by a content of a variable. The first field must be filled with the name of the variable. The second field must be filled with the part of the name of the table to be replaced. Fields Variables Lets you exchange the name of a select field with the contents of a variable. This switch occurs before the command is executed. The first field must contain the name of the variable, in the second field should be selected the name of the field to be replaced. Case sensitive Allows you to configure whether the connection will be case sensitive or not. (Differentiating case).